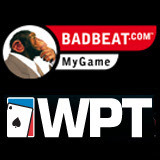 Badbeat.com, the original and leading online poker staking and training business, welcomes WPT Poker to its growing list of partner sites. Hands played at partner sites can be tracked by the unique hands analysis tool that is part of Badbeat.com’s free online poker training system. To celebrate this new partnership, a double deposit bonus is on offer when players sign up to WPT Poker on www.badbeat.com. WPT Poker, part of the Party Poker network, will match the player’s first deposit up to a whopping $100 and Badbeat.com will further match the bonus up to an additional $50. Players must act quickly as Badbeat.com bonuses are limited to the first 1,000 players to apply. “We’re thrilled to have one of the leading poker brands on board utilising our free MyGame poker training system,” commented John Conroy, Managing Director of Badbeat.com. The MyGame online poker training program builds players’ poker skills from the ground up using a unique "Play and Fix" approach. It analyses actual game play, spots weaknesses and shows how to fix them. Access to tutorials, the unique poker hands analysis tool, Report Cards, and Social gaming features are all free after registering a new account with any of Badbeat’s partner poker sites.